Anyone who is familiar with Croatia will know that it offers the most stunning beaches and crystal clear sea in the whole Adriatic. There are very few sandy beaches in Croatia, most beaches are pebbly and rocky and that is why the sea is so clean and has such beautiful colors. But for those of you who can’t resist the feeling of sand between their toes, here are some of Croatia’s best sandy beaches. Medulin is a touristic town in the southern part of Istria, only 7km from Pula. Medulin is well known for its beautiful 1km long sandy beach called Bijeca. The beach is especially popular with families with young children because of its easy approach to the sea. The beach offers water sport facilities, bars and restaurants, sunbed and parasol rental and many more facilities. The Crikvenica Riviera offers its visitors several beautiful sandy beaches stretching several kilometres along the coastline. 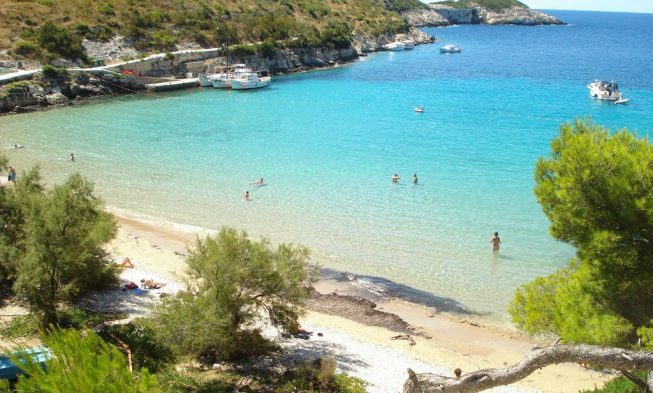 One of the best sandy beaches can be found in the Manestra Bay between Dramalj and the Kacjak peninsula. 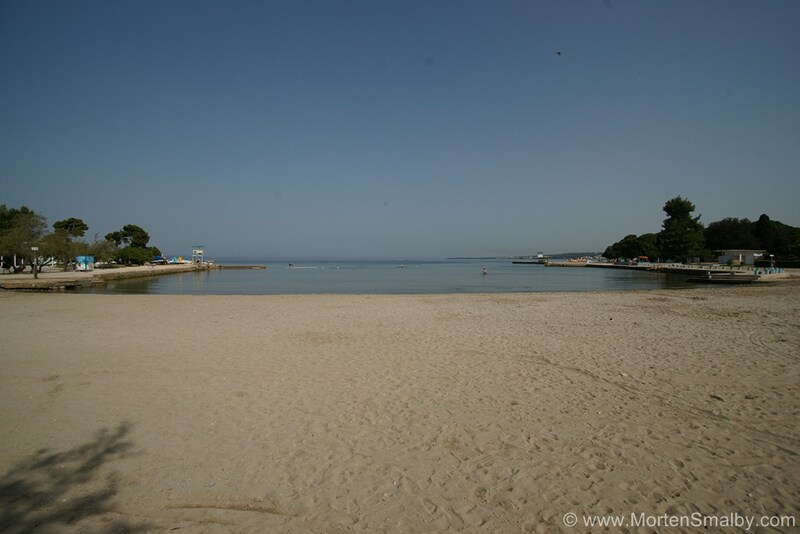 Other sandy beaches near Crikvenica are Balustrada beach and Crni Molo beach. The beaches offer plenty of facilities such as water sports, bars and sunbed and parasol rental. Krk island (which is connected with the mainland by a bridge) offers beautiful sandy beaches such as Komoriska beach (in Klimno Bay). This small beach is 30m long and 5m wide with lots of natural shade from the surrounding pine trees. Meline offers a stunning sandy beach that is around 400m long en 40m wide but there is no natural shade so don’t forget to bring your parasol. Baska beach is a lovely, hidden beach with very few visitors, but you have to climb down a long and steep path to get there. Paraside beach (Rajska Plaza) on Rab island is a 2km long beach with very fine sand, the entrance to the sea is long and shallow and the sea temperature is always pleasant in the summer. The beautiful surrounding pine forest offers natural shade. This beach is very popular with families with young children but also with the locals, so it does get crowded in the summer. The beach offers all sorts of facilities such as restaurants, bars, water sports, life-guards and facilities for the disabled. 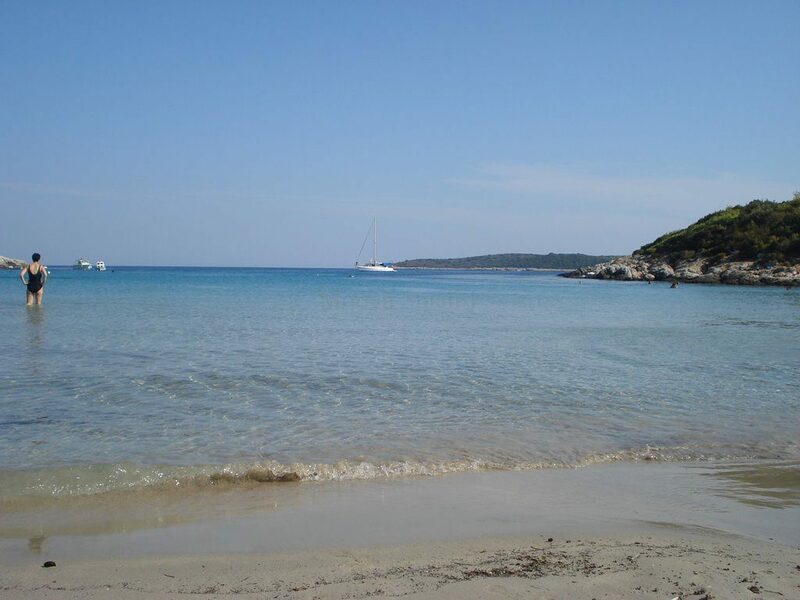 Saharun beach on Dugi Otok (Long Island) is a long beach facing the open sea. This beach lies in a beautiful cove with white sand, which gives the sea a lovely turquoise color. The sea is shallow and very suitable for small children. There is a small snack bar and plenty of trees providing natural shade. The beach lies south of Soline and can be easily reached by car. It is a one and a half hour boat ride from Zadar to Dugi Otok. Slanica beach on the island of Murter (which is connected to the mainland by a bridge) is a very popular beach with long shallow waters and lots of facilities. It lies near a hotel and a camp and is very popular with young people. There are lots of parties held on the beach during the summer. This is a great beach if you are looking for entertainment and fun, sport and games such as ‘picigin’ (a type of water volleyball). Ninska Laguna beach (Queen’s beach) in Nin (near Zadar) is a long sandy beach with shallow waters and pleasant, warm sea temperatures, ideal for young children. This family friendly beach offers plenty of facilities, including bars and restaurants, and is also well known for its medicinal mud which is a real treat for your skin. Mlaska beach on Hvar island is a large, 800m long beach with very fine sand and shallow waters situated close to Mlaska auto camp, 4km south of the small town of Sucuraj. The beach is popular with families and naturists and offers many facilities at the nearby auto camp. 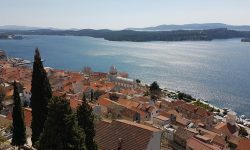 The beautiful island of Hvar can easily be reached by ferry from Split. 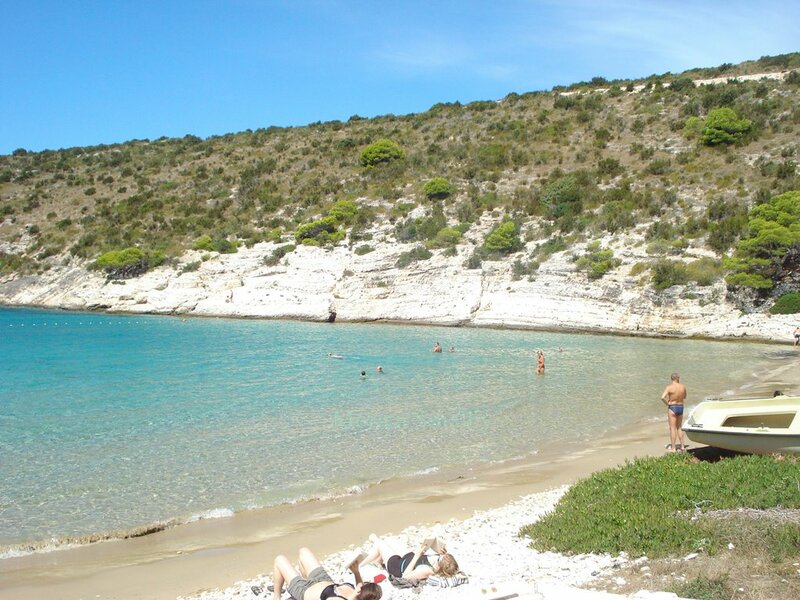 On island Vis several excellent Sandy beaches can be found, close to city of Vis the beach Stoncica is a must visit, a bit further in he city Milna another excellent Sandy beach can be found. On the small neighbouring island Bisevo the beach Porat can be found, one of the most stunning sandy beaches in Croatia. Vela Przina beach on Korcula island is located near the town of Lumbarda. The beach lies in a beautiful big bay which protects it from the northern winds and there is a lovely view on the open sea and the island of Lastovo. The beach is very popular with tourists and locals so it can get crowded. There is a restaurant and visitors can rent sun loungers and parasols. There are regular ferry routes from Split to Korcula. The Omis Riviera stretches for 35 km along a coast south of Split. The Omis Riviera is known for its large sandy beaches, especially between Omis and Dugi Rat. There is a 4km long sandy beach in the town of Duce and in the town of Omis there is a popular 1km long sandy beach lined up with many restaurants, cafes and shops where you will find everything you need for a relaxed and comfortable day at the beach. Bacvice beach in Split is most properly the busiest Sandy beach in Croatia as it is situated with in walking distance of the historical city centre in Split, the beach is excellent for kids as the water level is very low, actually you will have to walk about 100 meter out before you can actually swim. The low water is also reason why locals play Picigin here, a ball game which required acrobatic skills of the participants; the game is played all year around. Uvala Lapad beach is the largest beach in Dubrovnik and lies on a lovely promenade with many hotels, restaurants, sport facilities and children’s playgrounds nearby. This sandy beach is equipped with showers, changing cabins, sun loungers and umbrellas. The beach has life guards and is surrounded by lush palm trees, olive trees and pines trees. Trstenica beach (in Orebic) on the Peljesac Peninsula lies about 80 km north from Dubrovnik. 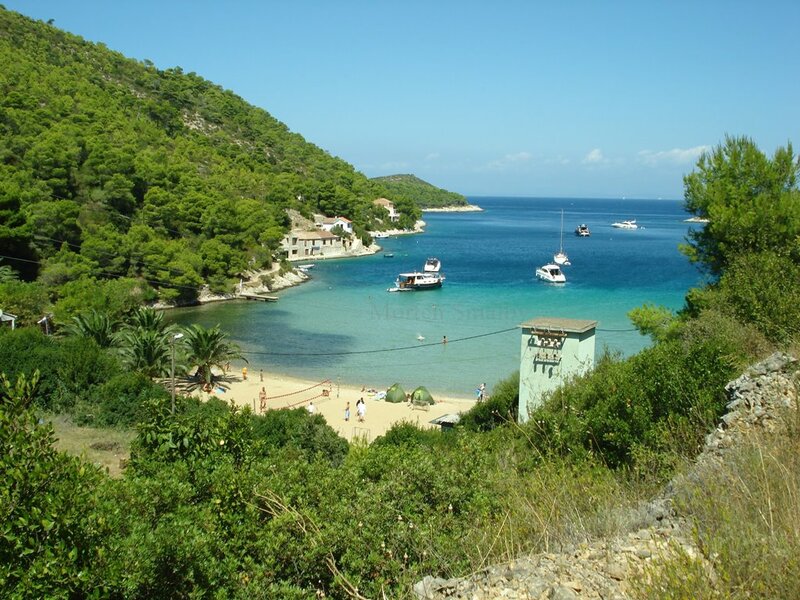 Trstenica beach is situated in a pebbly and sandy bay just a 15 min. stroll from the ferry terminal in Orebic. It is a 1km long family beach with shallow sea, natural shade, cafes, bars and play facilities for children. This beach, with a nice view over the Korcula Archipelago, is very popular and can get crowded at times. Mljet is a beautiful, largely untouched island that offers some excellent sandy beaches. Saplunara is an amazing isolated cove with two calm and sheltered sandy beaches that are protected because of their unique natural beauty. The beaches face the open sea and are surrounded with forests. This is the perfect place to visit if you want to escape the crowds. Mljet can be reached by ferry from Dubrovnik.